Rosa Jane Hewitt was born about 1835 in Lambeth and was baptised at St.Mary's church on 1 July 1840. She appears to be the only child of Richard and Jane Hewitt. The census of 1841 shows her living with her parents at Albion Place in Maidstone, Kent, The 1851 census shows Rosa at what looks like a private education at a house in Peckham Rye being educated by Mrs.Susannah White. Rosa married Henry Greatorex in the parish church of St.George Hanover Square in Middlesex in 1855, he having signed a Marriage Bond. They initially lived at his home at 9 Southampton Place, Southampton Street in Camberwell but then moved to The Grange in Guernsey. Their daughter Rosa Mary Jane was born in Jersey on 31 March 1856. They were next at 384 Kings Road Chelsea and son Henry Spratley was born in Chelsea in 1858. The 1861 census shows the family living at 281 Kings Road Court in Chelsea with their children and a servant. Henry is now described as a Zinc worker. Next they were at 9 Milton Street, Wandsworth Road in Wandsworth and by 1964 they had moved to 39 Danvers Street in Chelsea. On 29 January 1864, Rosa filed for divorce on the grounds of Henry's cruelty and adultery. On 15 February Henry filed a his own petition for the marriage to be dissolved, citing her drunkeness and frequent absence and adultery. The Daily News newspaper reported the hearing to take place at the Court of Probate and Divorce in Westminster on 8 March 1864. On 2 May 1864, Rosa set sail aboard the Houlder Bros ship Royal Saxon for a 140 day voyage to Melbourne, Australia. 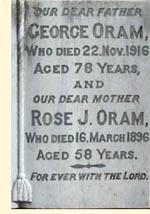 The following year she married George Coombs Oram in Orange, New South Wales. They settled in Mugdee and she bore seven children there between 1867 and 1879. Daughter Georgina died at the age of eighteen but all the other children lived to maturity. In 1887, Rosa sailed aboard the Orient Line ship RMS Ormuz from Suez to Australia, arriving in March of that year. The purpose of the trip is not known. Rosa died in Mugdee on 17 March 1896 and was buried in Mugdee General Cemetery where a gravestone records her along with her husband who died in 1916.